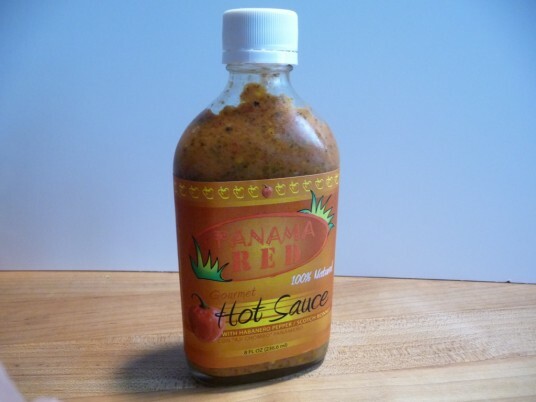 Panama Red Hot Sauce was the Grand Champion winner at this year’s 2012 Scovie Awards. This mustard based hot sauce brings on a fiery kick quickly, but the heat subsides just as quickly. And like many other habanero hot sauces, it’s quite a bit hotter tasted straight up out of the bottle than it is on food. Panama Red Gourmet Hot Sauce – that is a great name isn’t it? What child of the 60’s or 70’s can resist a sauce named after another substance we grew up with, made famous in song by New Riders of the Purple Sage? Normally I’m a big fan of mustards and mustard based hot sauces and barbecue sauces. But Panama Red doesn’t fall into either of those categories. It’s not a hot sauce like you and I are used to seeing, it’s certainly not a BBQ sauce at all, and it’s not even a kicked up mustard-type condiment. Panama Red (the more I type the name, the more I feel it’s a misnomer) is a unique and unusual bottled product. And as you can see is not “red” at all, but rather a dingy yellowish/orange color. Keep in mind, this was THE big winner of the Scovie Awards. Grand Champion should mean it just rocks beyond belief. But, and this may be an indication of how wrong the judging at the Scovie’s is (and THAT’S another post entirely), but I find it hard to believe that this sauce could take the top honors. Texture & Appearance: – Very thick and gloppy – even to the point of being hard to coax out of the bottle. The color is a surprising dark, flat rust color, with bits of spices and very tiny seeds suspended in a thick sauce. Taste Straight Up: – A strong front of the tongue burn from the Habaneros, er… Chombos, really sears the whole of the mouth. While it does subside just as quickly as it comes, there’s not much flavor beyond the weak mustard taste. If there is truly garlic, celery and culantro (cilantro) in the mix, they are certainly way down the list in strength, and the “raw cane sugar” sounds delicious, and probably helps keep this sauce from just being plain ol’ hot, it’s not that prevalant that I would call this one of those favored “sweet heat” type of sauces. Heat Level: – Landing about half-way between not hot, and very hot, the 2½ stars here are only because my initial impression was “this stuff really is too hot to enjoy” – but upon further multiple tastings, it’s waned on me, and now it’s not the Big Bad Wolf I first thought. Label/Graphics: – I should add Packaging to this sub-title because the nice hearty flask style bottle is a plus. But the overall color scheme and graphics pale on the label, and the only thing that stands out are the words “Hot Sauce”. The title “Panama Red” is in a color that, to me, just washes out. Overall Rating (Taste on Food, Final Thoughts): – I wanted to like this sauce. I really did. Pouring it onto pizza didn’t do it. Dipping Pita pieces into it didn’t do it. I even sampled it on Brats hoping that would be the winning taste-test combo, but that didn’t do it either. Once again, it all comes down to taste and flavor, and that’s where Panama Red falls flat for me. I will say there is a freshness to the taste, and kudos to the manufacturer for making it all natural and not using preservatives or artificial flavors. It’s just not a good flavored “hot sauce” – and I use that term loosely for the purposes of this review. Now, having given you MY thoughts on this product, your mileage may vary. In other words, maybe you will LOVE it. I felt it necessary to convey to you my impressions for an honest review. If you buy and try this sauce, I really would like to know what you think, so be sure to leave a Comment below and let us all know what you like about it. Disclaimer: I purchased this product for my own personal use and review purposes. No compensation was received. The thoughts and opinions expressed are my own. Can’t win them all, right? Happy Thanksgiving to you, Marilyn and your family. We come across a lot of “duds” in hot sauce and bbq sauce, but I was hoping someone would see or find something good in this sauce. Again, it just may be my personal taste preferences that don’t get “tickled” by this sauce, but I hope someone gets something out of the review. After reading this review I am very excited to see what you have to say about Howler Monkey Sauce. It will be nice to be able to compare two products that are of the same mold. I will say the major difference is HMS is vinegar based not mustard based. You actually see a lot of both variations across the tables in Panama. by the name of Congo, produce by Proluxa company. Can anyone help me? I had to use Google Translate to read it all. Thanks, Eric. I’ll be in touch with you by email. There’s a hot sauce I will soon be importing into the U.S. from Panama. The original home made variety is the brain child of a Caribbean/Panamanian bartender who has been selling the sauce from behind his bar there in Panama for the past couple of decades. The quality of his product speaks for and sells itself. Because of the Panama Canal and Panama’s status as an ultra-major international shipping locale his home made version has made it to the shelves of many kitchens worldwide. I’d like to send you a bottle of the commercial variety so as to get your thoughts and opinions. Of course it’s all natrual. Thank you for your consideration, Mr. Brian. It’s good to know Panama Red has some fans! As I said in the review, I really wanted to like this sauce. As you said, Chris, it might be a personal thing – personal preferences. Thank you for your comment and support of Panama Red – your thoughts are appreciated! 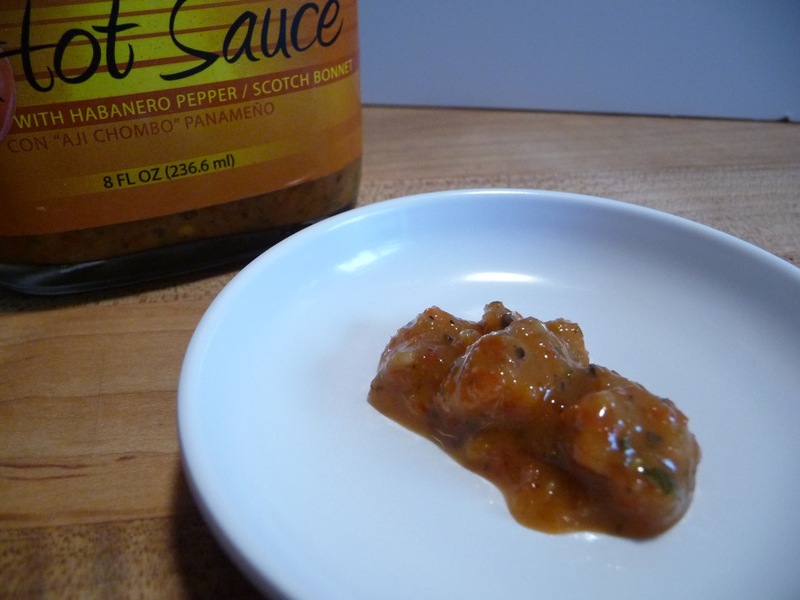 I visited Panama this July and fell in love with the habanero sauce. While in Panama, I ate the sauce with everything. I found this surprising because I am not a fan of hot sauce at all, but something about the Panamanian sauce I couldn’t resist. I guess it really is a difference of opinion and taste buds. I brought some hot sauce back with me and I have been trying to find some in the states ever since. I’m glad I came across your site. Well, thank you Diane. I hope you’ll become a regular reader with us, and that you find the perfect Panamanian hot sauce here in the states. Found Panama red at the Firey Foods Show in Abq, NM. and usually buy plenty of other sauces. This was the first to go and was a staple on the kitchen table. I finally purchased a load (10 bottles) for x-mas. My intentions were to give them away but could only part with 1 and almost finished another. Sorry [email protected]$c0 i have a new hot sauce. Yes i will give another bottle or so away just to share the love and a great product. Wow, Paisano – that’s a great way to share how much you like this sauce! Thanks for telling us, and thanks for reading.